At the end of October, ArtStarts was delighted to present free hands-on painting workshops with Victoria based artist and teacher, Sandi Henrich. To begin, young participants engaged in conversation with Sandi about the life, challenges, and inspirations of internationally renowned artist and author Emily Carr (1871-1945). Sandi explained that Carr encountered many challenges but that she persevered, despite her struggles as a female painter. Sandi encouraged participants to be inspired by Carr and top move forward and to keep trying when faced with adversity. Next, examples of Carr's landscape paintings provided the backdrop for participants to think about what sorts of inspiration, materials and techniques Emily Carr used to create her fascinating forest landscapes. 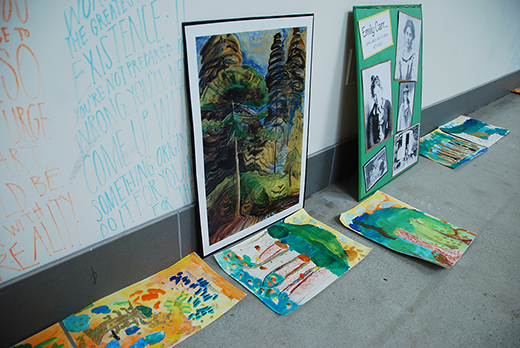 Like Emily Carr, participants were ready to draw artistic inspiration from the rich coastal forests, and the biodiversity of the Pacific Northwest Coast and Northwest Coast peoples. Using oil pastels, they began sketching away! Sandi then encouraged everyone to use their fingers to smudge and blend brown, grey, black and gold pastels prior to layering watercolors over the pastels – a technique she called "giving a wash". 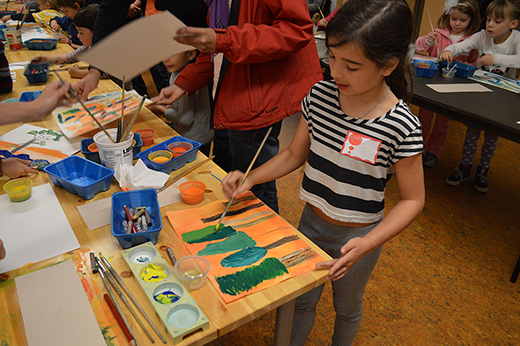 Everyone got creative while experimenting with different brushstrokes and mixing paints. 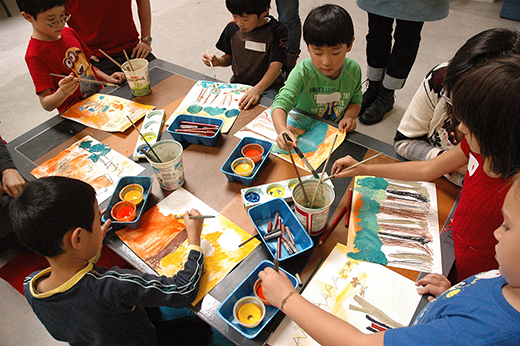 Participants made green by mixing blue and yellow and experimented applying different layers of paints. They also added white paint to achieve desired shades of greens and blues. 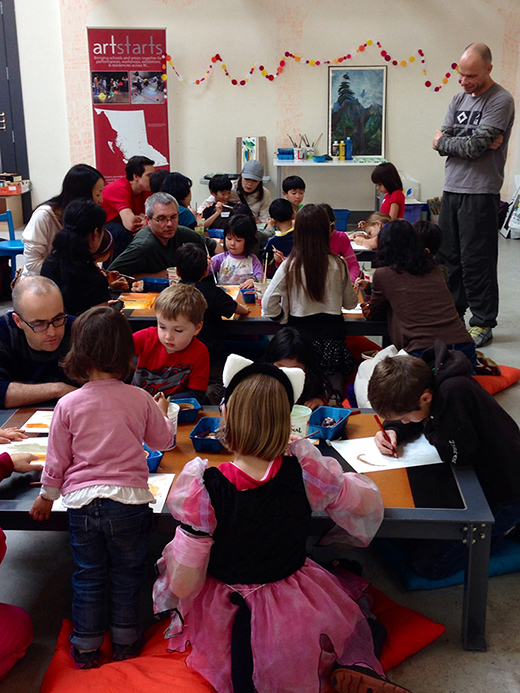 One of the highlights of a workshop was one young painter suddenly shouted out, "Look! I made MAGIC BLUE!" 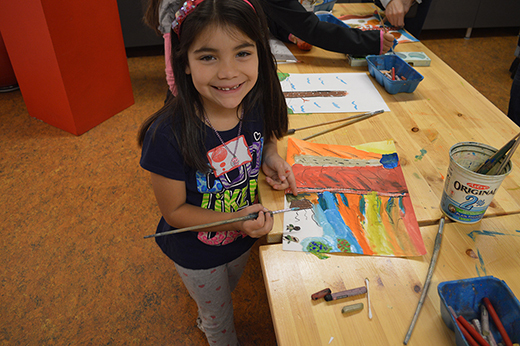 To add the finishing touches, participants used gold paint using Q-tips to apply dots and rays of sunshine to their landscapes. 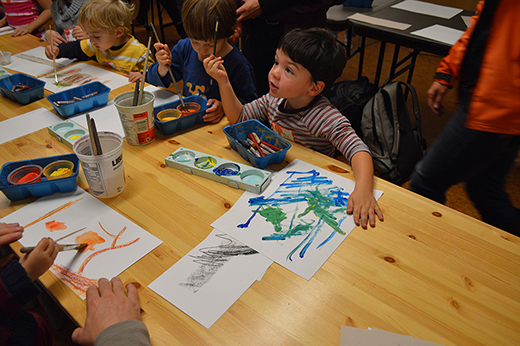 This mixing and exploring of paints resulted in a unique one-of-a-kind landscape painting workshop, which reflected our equally unique coastal forests. 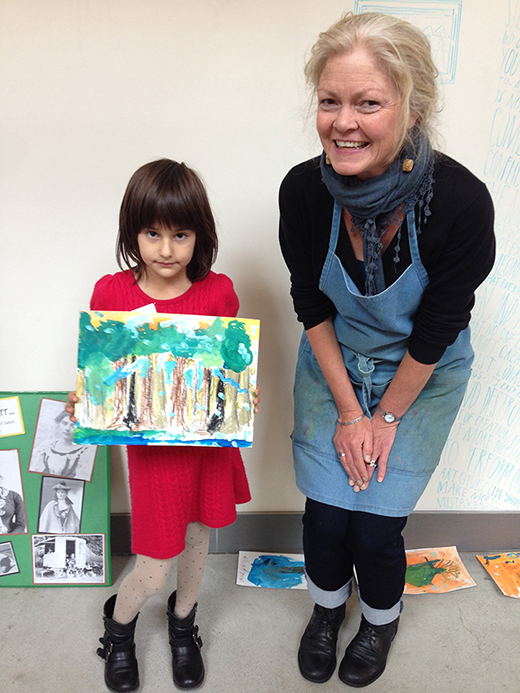 An extra special thank you to Sandi for introducing these young painters to the work of Emily Carr and for promoting an appreciation of nature and exploring new painting techniques to represent the magnificent landscapes and forests which surround us here at home! You can learn more about Emily Carr''s life and paintings by exploring the Vancouver Art Gallery's new Emily Carr website. from ArtStarts at River Market. We look forward to seeing you at our next event: Think Bigg with Trent Arterberry. Join us at ArtStarts on Saturdays in Vancouver on Saturday, November 29 and at ArtStarts at River Market in New Westminster on Sunday, November 30. While at the ArtStarts Gallery, you''ll also catch the opening weekend of our new exhibition, Dwellings: From Seabeds to Cityscapes.